This is popular philosophy, in the same sense as 'popular science'. It covers a lot of ideas from academic philosophy, but is written with the general public in mind -- up to a point, anyway. That point being that the general public has little interest in philosophy, so readers drawn to Mr Crocker's book are likely to have some interest in the subject already. The same kind of readers, perhaps, who have read Richard Dawkins, or John Humphries, or other writers creating the mini-wave of popular atheist texts doing the rounds at the moment. "An Enlightened Philosophy" takes the rather nihilistic view espoused by such authors and attempts to salvage something meaningful, even spiritual, from them. The book is generally analytical in tone. The current 21st Century battlefield that it finds itself in the middle of is the 'atheist versus theist' debate. Crocker argues that the atheist argument is a strong one, but the current supremacy of the new philosophy (in Europe, that is) creates a milieu lacking in moral direction. Science and technology need morality, he argues, and the reason underpinning science finds a potential philosophical partner in the Enlightenment of the 17th and 18th centuries. Certainly, at a philosophical level his points are well made. However, the author's understanding of the science seems less-well founded, particularly his appreciation of the ideas behind string theory (p46). But this is later amply compensated for by his excellent description of post-modernism, and our place within it; which I found very instructive because post-modernism often defies an adequate definition. Inevitably, the book turns to religious ideology. The author appears to accept the existence of the soul, but despite this has a problem with religious teaching in general. I suspect the book reflects a personal journey in this regard. Whilst rejecting religion (and he offers a blistering attack on organised Christianity), he seems uncomfortable with the soulless universe espoused by Dawkins et al. If the Bible offers useful teachings, then they are allegorical, and non-literal. He draws on the work of French philosopher Andre Comte-Sponville when arguing for the central importance of justice in human affairs. For the author, this is where Christ's teaching are most powerful and poignant. The wisdom is important, rather than the sanctity of belief - he argues that non-religious people can embrace the ideals promoted by Christ, without accepting the doctrines that have grown up around them. There is, of course, a distinction between wisdom and religious belief. Sometimes they will coincide, or be derived from one another. Other times, they are quite separate. One might seek wisdom from Confucian or Buddhist teachings, for instance, which, at their core, rely on no God underpinning the universe. Even atheism offers a route to the creation of social justice amongst humans, through the evolution of empathy and communal requirements to function well together to survive. Dawkins argues for evolutionary routes to such outcomes, and Desmond Morris would certainly be able to show how the human animal is capable of civilised behaviour without the requirement for religious education to found and teach morality. One could reasonably argue that morality is innate within humanity, and developed on a social level as a result of individual natural selection. This opens the door to Humanism as an answer to the author's conundrum -- a movement not well covered in this book. The book's general thrust that religious literature can offer much to atheists and agnostics who have no desire to accept doctrinal belief offered by religion is not exactly unique, or even particularly profound, I think. But this book still has much to offer - it is succinct, analytical and full of the same wonderful thinking that gave the Enlightenment its light. A worthwhile read for deep thinkers, to be sure. 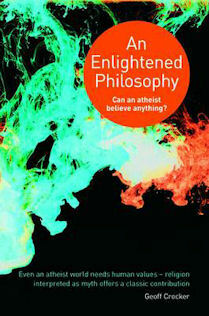 Subtitled "Can an Atheist Believe Anything?"